Before I started to colour the table clothes I made a double hem on all sides. To do so, I folded in one cm on one side and immediately afterwards another cm so that the frayed edges of the fabric cannot be seen anymore and cannot fray any further. Then I fixed it with pins and repeated the whole procedure with the other three sides of the fabric. Before I sewed the hem with the sewing machine I also tacked it. Now the basic table runner is ready and you can start with the fun colouring part. :) For this reason I made a Christmas tree stencil with the help of a cookie cutter and a small piece of cardbord. Then I put the stencil onto my fabric and painted it in with gold textile colour. Be careful not to use too much colour, otherwise the colour may get under your stencil and the Christmas tree may lose its form. 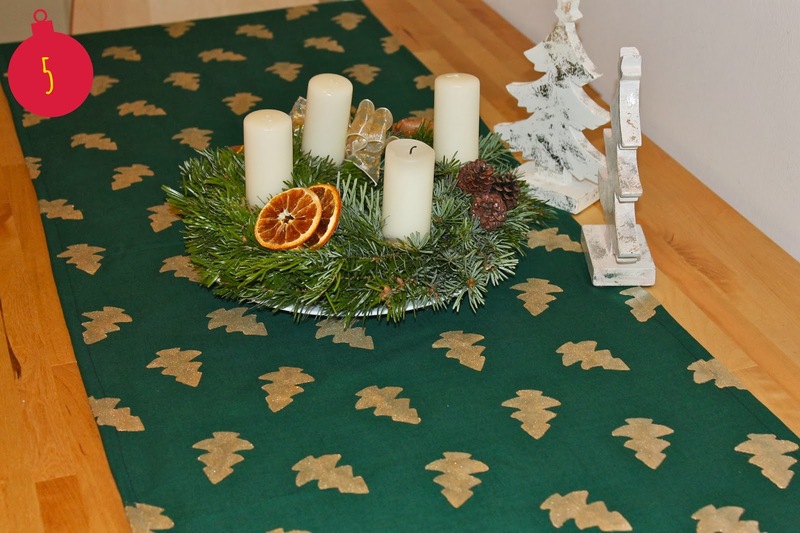 Don't forget to put some paper or plastic under you table runner to prevent the colour from seeping through onto your table.